Baxter has been forced to make several changes from the previous round when they defeated Botswana 2-0. 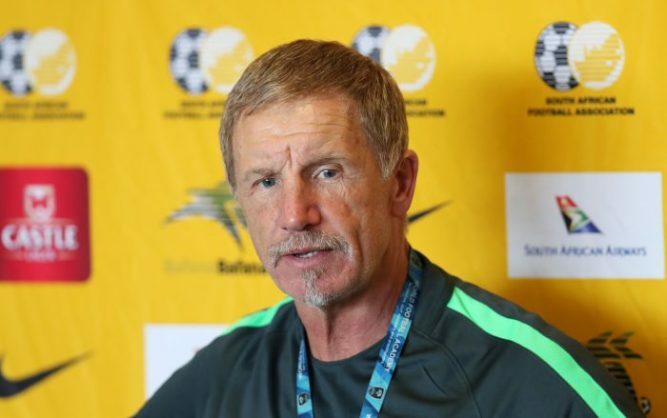 Bafana Bafana coach Stuart Baxter has announced his starting line-up for the first leg of the third and last round of the 2018 CHAN qualifier against Zambia in East London on Saturday. Bruce Bvuma retains his place goals to earn his second cap. Captain Mario Booysen and left back Tercious Malepe are the only survivors from the last match. They will be joined by Asavela Mbekile at right back, while Sandile Mthethwa gets his first start in Bafana colours as he will play alongside Booysen, who will be playing his sixth consecutive match since making his debut in the COSAFA Castle Cup tournament in July this year. Mbekile last played for Bafana in November 2016 in an international friendly match against Mozambique, and will be earning his fifth cap for South Africa. Sibusiso Khumalo, Jabulani Shongwe and Jamie Webber will occupy the midfield, and will be assisted by forwards Ryan Moon, Dumisani Zuma and Gift Motupa. Shongwe’s last appearance for Bafana was in San Pedro Sula in the 1-1 international friendly match against Honduras in 2015. The quartet of Webber, Zuma, Motupa and Mthethwa were on the bench in the second leg clash against Botswana. Motupa will earn his ninth cap to become the highest capped player in the side. Five uncapped players have been named on the bench – Lindokuhle Mntambo, Thabo Lingwati, Masilake Phohlongo, Steven Hoffman (GK) as well as Wiseman Meyiwa who only arrived in camp on Thursday. Also starting on the bench will be Menzi Masuku and Siphelele Ntshangase, who started against Botswana in the return leg.